Berkley Fusion Superline EWG hooks are targeted to everyone, from the novice to the avid angler. 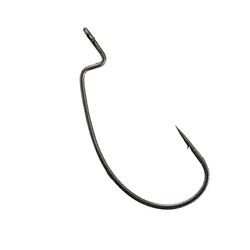 The Superline EWG is a larger diameter hook designed to fish braid in heavy cover. This Berkley hook has a needle point with a SlickSet coating for easier penetration. Features a Stamped bend and increased diameter for increased strength.